In addition to photographing airplanes and bridges, I enjoy doing zoo photography. Zoo photography is a little more challenging because you have to work with natural light, the enclosures are often in the way, you cannot pose the subjects, and the zoo visitors get in the way. The end result of a good shot is a photo that looks like it was taken in the wild. 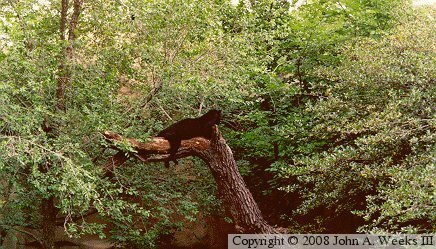 Here is a group of my favorite big cat photos from the 1989 to 1993 era. Note that these are copyrighted photos and may not be used without written permission. This African Lion is at the Indianapolis Zoo, located in Whitewater State Park near downtown Indianapolis, Indiana. This is a relatively new zoo having been founded in 1968, and being at its current location since 1988. It is not an overly large zoo, but each exhibit is well done. 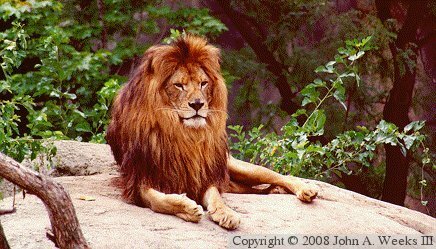 The Indy Zoo is a member of the Species Survival Plan for the African Lion. This lion is doing what a male lion does the most...lounging around on his favorite rock. This female African Lion at the Los Angeles Zoo, located in Griffith Park just northwest of downtown LA. This zoo is also relatively new, having been founded in 1966. Zoo LA is a very large facility with a wide variety of animals. The warm climate allows the zoo to grow a wide variety of plants that are native to the areas where the animals would live in the wild. This makes the zoo photos look a little more authentic. 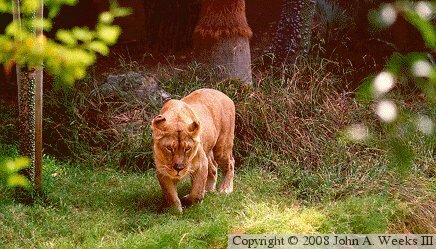 In this photo, the lioness is on patrol walking around her habitat waiting for an early morning meal. This is a tiger at the cat complex at the Henry Doorly Zoo, located on the west side of Omaha, Nebraska. The Henry Doorly Zoo is one of the oldest zoos in America, and it is famous as the home zoo of Marlin Perkins, host of ‘Mutual of Omaha’s Wild Kingdom’. The cat complex was the largest cat facility in America when it opened in 1977. It is a key facility in supporting the Tiger Species Survival Plan. This tiger is doing what cats do the best, and that is sleep. A tiger may sleep 18 hours a day. 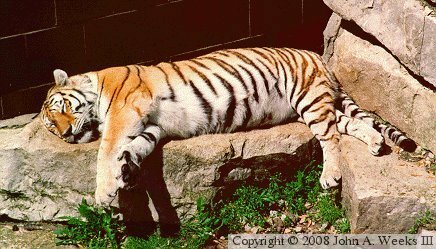 Since a tiger has no natural predators, it doesn’t have to worry about being attacked when sleeping. This Siberian tiger is taking a dip in the pool at the zoo in Houston, Texas. The Houston Zoo dates back to the early 1900s, but the bulk of its exhibits were built shortly after WWII. Animal exhibits from that era were mostly cages with bars and concrete. A large effort was made by the zoo in the 1980s to update these old exhibits into habitats that are much more animal friendly. 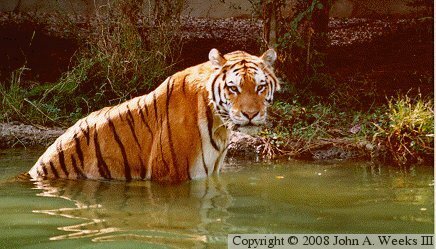 In this photo, the tiger is out for a swim on a very hot and muggy morning, shooting down the myth that tigers do not like the water. 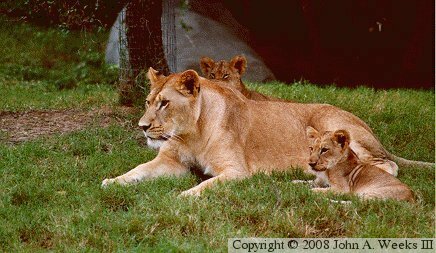 This is another photo from the Houston Zoo from October, 1991, showing a lion with her cubs. These cubs are both females. There is a 3rd cub, a male, who is hiding behind a rock just behind his mother’s tail. The cubs were 6 weeks old at the time, and this was the very first day that they were on display. The crowd appears to be a little too close for comfort based on the mother’s intense stare towards the crowd. As a result, keepers brought the lions in after about two hours. These are two young male leopards located at the Houston Zoo. Leopards carry spots, but the spots are a complex pattern called a rosettes rather than simple solid spots. The spots are in the hair only, and not on the leopard’s skin. This is in contrast to the tiger and jaguar, where the spots are on their skin as well as in their coat. Leopards like to sleep much of the day. They search out spots where there are high outcroppings of rocks to give them good visibility and a place that they can defend. 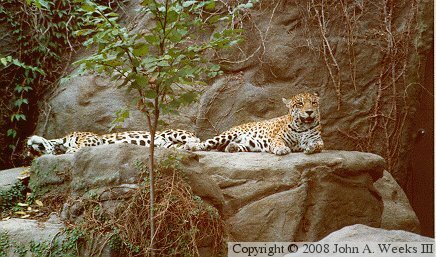 As a result, leopard habitats are normally built with a similar rock outcropping. Leopards are considered to be one of the four ‘big cats’ along with tigers, lions, and jaguars. This jaguar is at the Brookfield Zoo in the western suburbs of Chicago, Illinois. The Brookfield Zoo dates from the depression era, and it once consisted of the worst of the cage and bar type exhibits. New ideas came to the zoo in the 1980s, and at one point, the zoo was all but shut down for much of a 3 year period as the bulk of the cage and bar exhibits were removed and modern habitats were built. The result is very modern zoo that is also very easy for the visitors to see everything. The zoo features one of the first indoor tropical exhibits, which is worth the trip by itself. This jaguar is known as a melanistic, which is a genetic variation that leaves the cat with a black coat. This cat spends a lot of time in this tree. At times, it faces away from the crowd so it can watch the keepers and see when lunch is being served. At other times, it faces towards the crowd to watch the zoo visitors. These three young lions are on display in the Lion’s Pride exhibit at the World Famous Topeka Zoo in Topeka, Kansas. This zoo is known for its innovative exhibits, unusual for such a small zoo. As an example, the Topeka Zoo has one of the first indoor tropical rainforest exhibits. This photo was taken shortly after the Lion’s Pride opened in 1989. 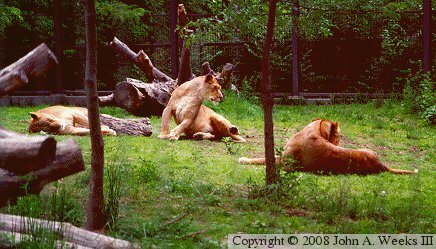 Zoo keepers put the male and female lions outside on alternate days. The Topeka Zoo ran into a period of mismanagement and neglect in the late 1990s, and it lost accreditation in 2001. The city of Topeka was forced to replace the management and revamp the facility in order to regain its accreditation. The end result is a much more modern and animal-friendly facility.